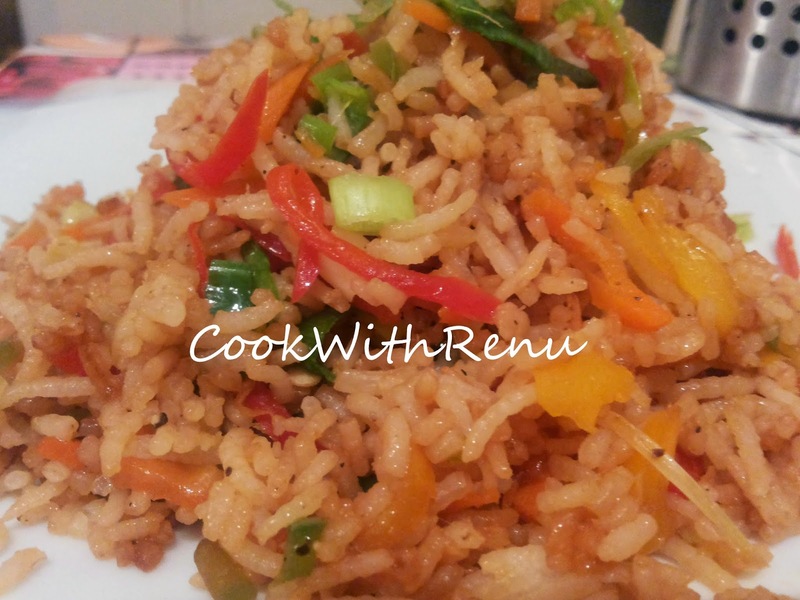 Rice with the goodness of vegetables…and give it the name Chinese everyone simply loves it. Good thing is that we do not cook the vegetables in Chinese or rather Indo Chinese too much so the goodness of the vegetables remains. Enjoy the crunchy vegetables with Manchurian or any chinese gravy. Simply yummy. Note: I also do add cabbage at times as it is hardly seen. Soak the rice for at-least 15 minutes. In a large pan boil Enough water, around 4-5 cups. Add 1/2 teaspoon salt in it. Once the water starts boiling add the rice. Now cook the rice till 90% done. Do not cook fully or else it becomes soft and break when you mix it with the vegetables. The remaining 10% of Rice gets cooked when you mix it with all the vegetables. Use a strainer to drain the water. In this way the rice is cooked more properly and opens out very nicely. In a large wok or Kadai add the Olive oil. Once the oil gets heated add the Onion. Cook them for 1 min. Now add the vegetables starting with Carrot and Beans. (Always cook Chinese on high flame). Cook them for 1-2 minutes. Add the bell peppers and cook for just a minute. As they get soft easily. Add the rice and give it a gentle mix. (or else the rice will break and become a lump). (cane reduce the flame for the time being. Yippee its ready, now garnish it with Green onion leaves and serve it hot with Manchurian or any Chinese gravy dishes.